Pillar (to post) in front of the Paley Center for Media, 25 West 52nd Street. Note the video screen in the window — the voice is in the air. Image: Martha Wade Steketee. I spend some time at the Paley Center during my first visits as a new member (inspired by this Garland television retrospective), simply drinking in the location. Outside on the block of 52nd Street between 5th and 6th Avenues cultural streetlight banners honor the event. The building’s front pillars and video/audio display beam Judy Garlands handsome face and sparkling performance artistry in snippets from a video loop playing in the flat screen displayed in the street level window. My heart beats faster (each time, every time, for the 12:30pm start time of each 2-hour installment of this retrospective adventure) when I enter the cool confines of this classy establishment. Each day, every day, I know I will be viewing images I have seen in some form before — DVD or youtube clips or projected on a friend’s wall. But never ever have I seen these images on big screens using state of the art equipment. That dimension of these screenings combined with the instant community formed among old acquaintances and new friends creates an irresistible combination in midtown Manhattan. The Paley Center is located due west of ’21’, the famous eating establishment. West 52nd Street is also known informally (I’ll snap one of the street signs as the days go by) as “Swing Street” in honor of the many jazz clubs and cabarets that populated this part of the town in the early and mid 20th century. 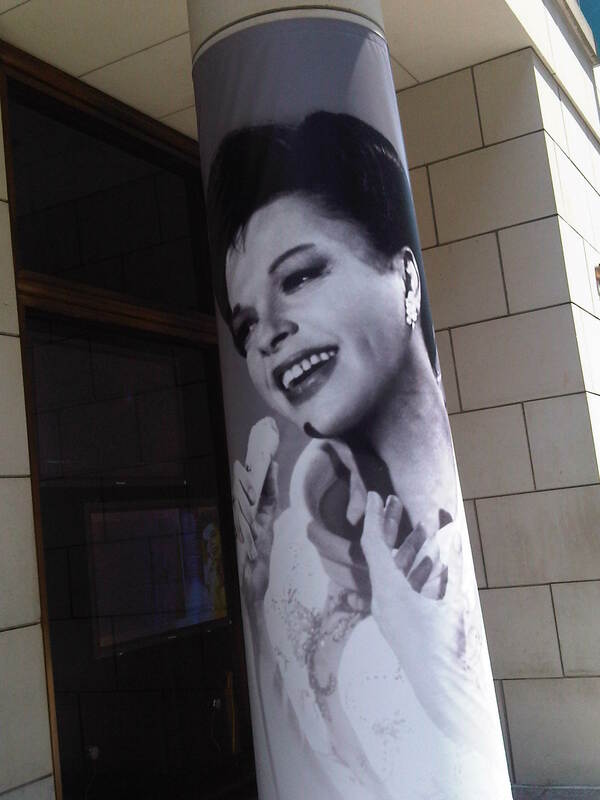 How fitting for a location to honor the raconteur (see Jack Paar’s show from December 1962), the live performer (goodness ANY of these performances), the singer with the jazz soul (see “Poor Butterfly” among many gems from The Judy Garland Show 1963-1964 series), the consummate entertainer. Ford Star Jubilee (1955). 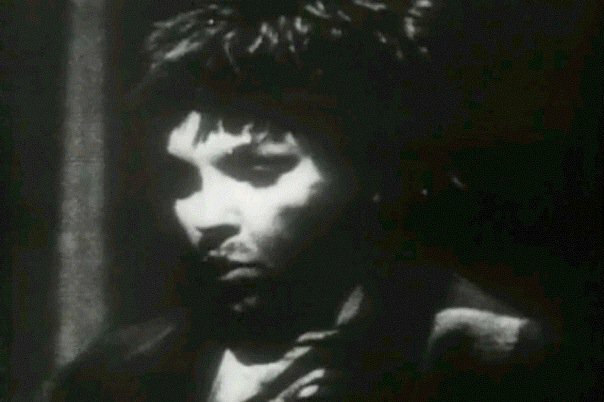 Garland in tramp makeup from “A Couple of Swells” performing “Over the Rainbow”. At the time of the 1955 special, Garland had given birth to her son Joe a few months before. The set list is an adapted version of what she has at this time performed for many months at many venues across the country, featuring an extended call out to the Palace Theatre itself. She is delightfully informal and off-hand in these numbers, with some definite vaudeville flavor courtesy of sidekick David Wayne and a Japanese youngster with good singing pipes. 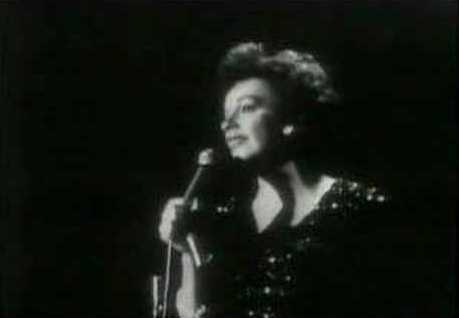 In this show, Garland provides one of only three performances of “Over the Rainbow” she gives on television. In this version of her signature tune her voice is hoarse but her emotional through line is true — she tells the story. Devastating. The 1956 special is directed by Richard Avedon — there is good humor and attempts at stylishness that you can tell bemuse Garland at times. Sunday Night at the Palladium (1963). “Smile”. Thursday July 21 we start our adventure with a few minutes of a taped interview (just Garland’s side) on the set of Judgment at Nuremberg (1961) in which she plays a straight dramatic role. She talks about the film, her role, and answers questions about her own career. In what we can imagine is a question to her such as “do you regard yourself as a singer or an actress” she states “I suppose I’d be called an entertainer, I think.” I should say. 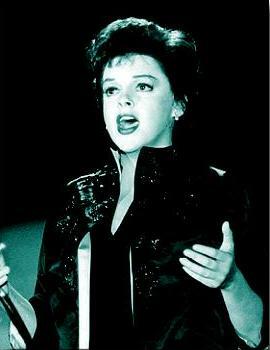 The Judy Garland Show (special with Frank and Dean) (1962). During “Just in Time”. The 1962 special with Frank Sinatra and Dean Martin (shown at the Paley blissfully un-colorized), and the 1963 special with Robert Goulet and Phil Silvers are each 55 minutes with commercials (a little slice of American cultural history — carpets and cars and other products sold). And so many special moments writ large. Both specials are familiar to me on the small screen but this time through, many moments bring gasps from the power of her performance or little smiles while noticing small details on-screen. The boffo “Just in Time” arrangement crafted by Mort Lindsey and Kay Thompson for her and honed in public performances for some months before this special was filmed is quietly killing. I find myself trying to imagine a suburban U.S. television viewer tuning into this particular show, with this opening, seeing this performance for the first time. It leaves you breathless, and modulates, as many have observed, over and over and over again. I gasp every time. “Just in time, I found you just in time, before you came my time was running low.” In addition to the aural treats there are small visual details newly apparent in this large format. For example, in a scene in which you come upon Frank and Dean seated, sullenly, at a long angled bar singing a few bars of “The One I Love Belongs to Somebody Else”, the ashtrays on the bar (when we’re in closeup) display the name Romanoff’s quite prominently (a favorite hangout). I observe to myself and aloud to others later that I am struck by the rapt silence of our audience — captured, breathless, engaged, and resisting the applause she brings you to over and over again. Robert Goulet and Judy Garland in Judy and Her Guests (1963). Could it be the medley of songs performed by Judy Garland and Robert Goulet in the 1963 special are among the hottest, sexiest minutes ever filmed on network television? The kiss at the end of “If Ever I Would Leave You” — THAT’S a finish, ladies and gentlemen. Now I won’t say that it was the solely the afterglow of this particular sequence that led a small cadre of the attendees to talk for some time after the screening was over and then to wander down to a coffee shop to continue to debrief the many moments and performance nuances. But for me, yes, this played a part. 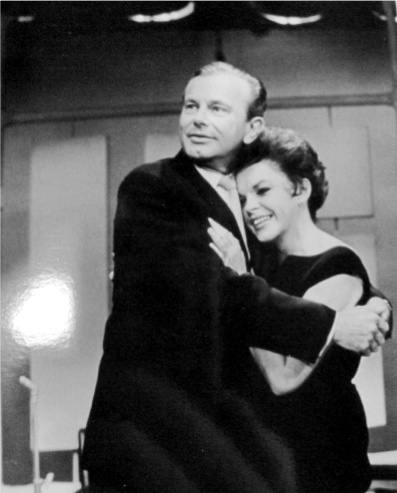 Jack Paar and Judy Garland. December 1962, on set. Friday July 22. “All of us have given our hearts to you so many times you have permanent possession of it.” Jack Paar says this in the early moments of his interview with the mesmerizing, masterful story-teller in song, in words, in play in December 1962. Jack and Robert Goulet and Judy Garland cut up, tell stories, sing songs, laugh with each other, clown around. And for Garland, she sexes up the joint. On this talk show appearance, Garland shows the world what her friends had known for years: she is funny, quick, a fabulous story-teller, incredibly self-effacing (about her M-G-M cohort “Have you seen us since we’ve come out? We’re a very peculiar group.”) and generous (note her stories about concert tours and productions — she always uses “we” and never “I” … it is about the work). Some have referred to this appearance as the trial run that lead to her CBS television series the following season but what do I know about that? What I can see, and my fellow audience members could see bigger than life-size on the screening room wall at the Paley Center this blisteringly hot July day: this performer enchants, the woman amuses, the storyteller spins tales, the laugh is contagious. And the singer kills ya. 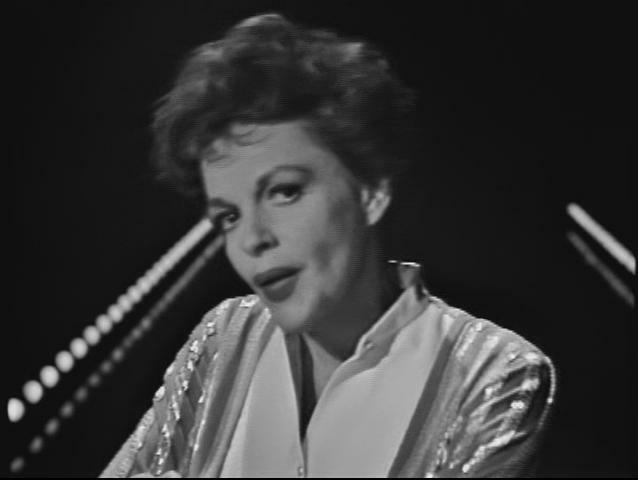 from The Judy Garland Show episode 3 (1963). “As Long As He Needs Me”. The final set of presents in this day’s screenings is a compilation of segments from Garland’s 1963-64 CBS series culled from among the episodes that will not be shown in their entirety as the retrospective continues. My colleagues (new friends, old acquaintances newly met in person, others) and I compare notes afterwards again in a Paley Center lobby then over milk shakes — which pieces have always been favorites, which pieces taught us something new with the new scale and the enforced attention in a theatre seat, what surprises we encountered. From “A Cottage For Sale” to “As Long as He Needs Me” to “Once in a Lifetime” to “Poor Butterfly”, we were all in happy tears by the session’s end. For those who have seen these televised performances on DVD or film or youtube or other media, these screenings in fabulous facilities are a visual and aural revelation. For those who have never seen these sequences before, a huge series of presents await. And bonus, as I have found over the years, when similarly constituted people convene to appreciate the artistry, a special kind of synergy occurs, a chemical and emotional connection is made. And the events have just begun. Thank you, Martha, For those of us who cannot be there, this vicarious thrill is most appreciated. Martha, you had me on “spending some time at The Paley Center….” I was hooked at the poster of Judy on the pole with a heart-opening connection to our bench wench/dude days at TV-City. I love your description of “Smile”. I recall Sullivan saying at the time that Judy mesmerized everyone the night before at The Palladium concert she did as a benefit for Thalidimide babies. Everything you recounted let me re-live some wonderful moments- the best musical moments of my life. I remember the excitement of the first sixties concert spec with Frankie & Dino and the O’Flaherty (?) who remarked his televisopon was still vibrating….Thx again for your compelling reportage! Thank You – you made me feel as if I was there . p.s. I watched the Friday July 22 program again during its 2nd showing on Sunday August 7th — pad and pen down, just drinking in every moment. Luscious. “for this is my moment, my once in a lifetime”. my goodness.